I remember the first time I stood in front of a classroom of rising fourth grade students. Prior to that moment if you’d shown me an average-sized Chinese ten-year-old my gut reaction probably wouldn’t have been blind terror, but a chalkboard can change a lot. For Corinne Hua chalkboards have been changing things in Shanghai, China for nearly a decade. Hua is the relentless force behind Stepping Stones, an NGO that concerns itself with the education and wellbeing of migrant children in Shanghai and beyond. 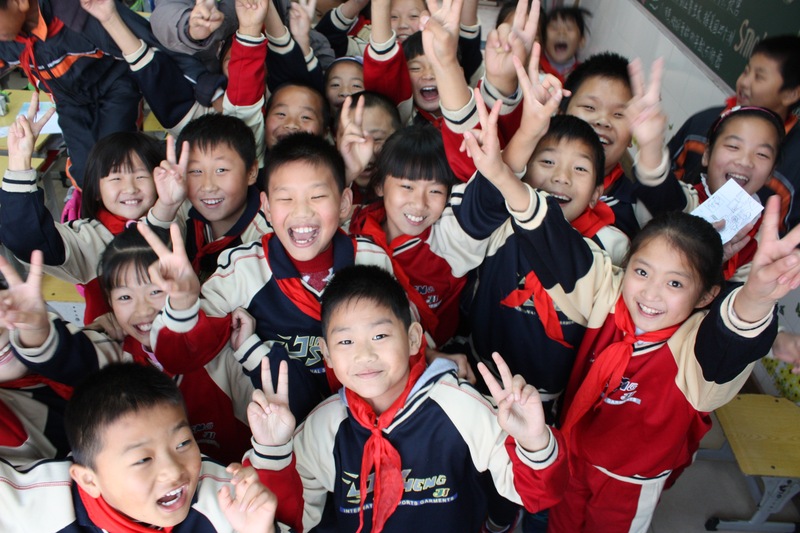 Stepping Stones had humble beginnings in 2006 with only a few volunteers and a desire to reach the children who are left behind by both China’s education and hukou systems. Today it boasts nearly 350 active volunteers and has provided 2,363 free pairs of glasses to date. 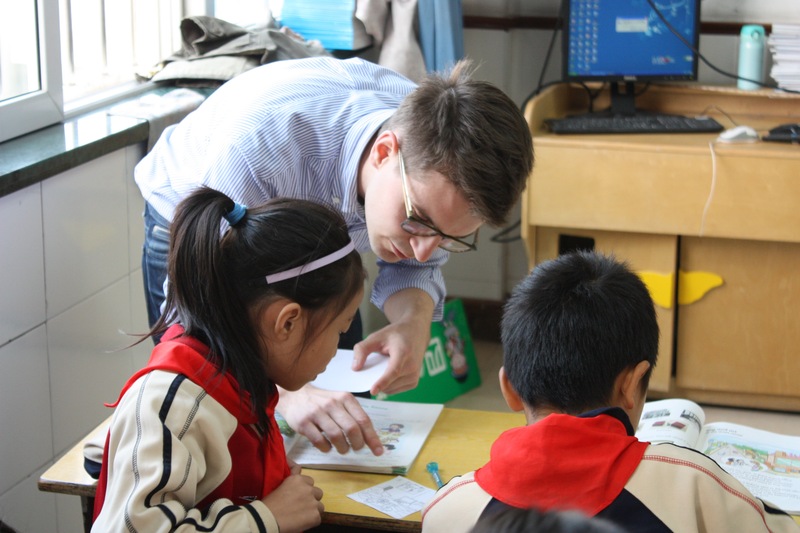 These volunteers largely provide English language support, as English is one of China’s three core curriculum subjects and is the one most often overlooked in migrant schools. On the first Monday of November, I join six of these volunteers as they gather outside of the Shanghai University subway stop to head to S Elementary School (name not included to shield school from any unwanted attention from authorities), one of Stepping Stones placements. 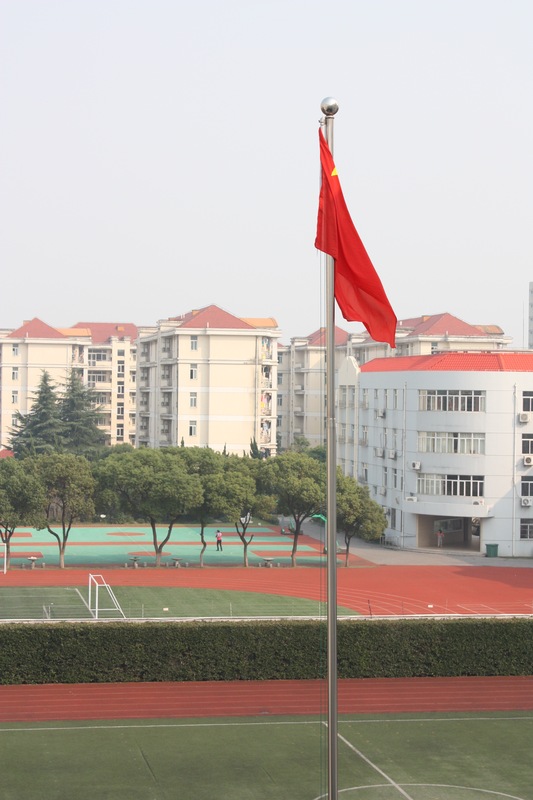 S is one of Shanghai’s government-run migrant schools, serving students who are not registered with a Shanghai hukou. Previously these schools operated outside of the formal Chinese education system, and still do in most cities outside of Shanghai—including Beijing. However, in 2008 the Shanghai government stepped in to manage schools like S and the 157 other migrant schools that currently operate in the city. We take a bus several stops from the subway and get off about a hundred yards from the school on a stereotypical Chinese street. The school is a repurposed public school, and from the outside you wouldn’t know how it’s different from any other. Internally, however, the differences become more obvious. As we scale the staircase to prepare for two 35-minute periods of English language review, children flow around us undeterred. Though Shanghai puts other countries on edge due to its excellent test score statistics and expertly executed morning exercises, the hallways we walk through are both chaotic and understaffed. We are led to an unused office by Lara Butera, Stepping Stones’ Site Coordinator who is currently working on her MA in International Education and teaches at a local university. The rest of the volunteers hail from Canada, Korea, Switzerland, China, and the US. For a group of seven (one volunteer drives to the site) they are diverse in both origins and English accents. Though Stepping Stones began with largely trailing spouses as volunteers, it has expanded to include people from all walks of life and is currently split almost 50/50 between local and foreign volunteers. According to Stepping Stones policy the volunteers split into groups of at minimum two and step into their classrooms. They are armed with only a day of immersive EFL training and a Baidu Cloud folder of teaching materials in their arsenal. 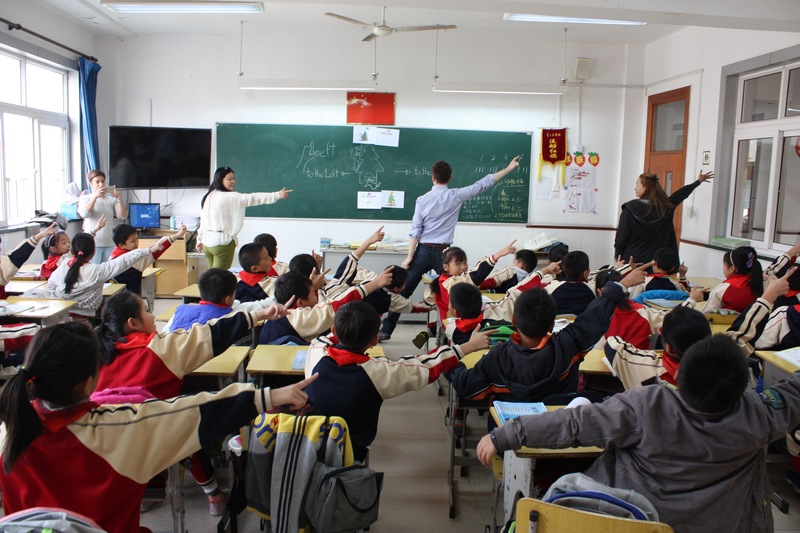 A lack of teaching experience is a common concern among English teachers throughout China, but these classrooms are a far cry from the lucrative teaching jobs at international schools that foreigners tend to flock to. Though their inexperience shows, it is to their credit that the Stepping Stones volunteers willingly step in front of chalkboards to gain experience and give whatever they can to Shanghai’s migrant children. Not only do they give what they can, but Stepping Stones volunteers also offer a level of consistency that is rare in this kind of volunteer activity, returning to the same placement sites week after week, some of them for years. During the two 35-minute periods I watch things go well, as students giggle with fascination that their left hands create an “L” shape, and I watch new teachers struggle to connect with students in an immersive English environment. “Where is Kitty?” Julia, a returning volunteer, asks her class of fourth graders. “Is she behind the box or in front of the box?” Despite the occasional shouted reminders from their homeroom teacher to quiet down, the students are lost and likely to remain that way. Stepping Stones cannot provide full time teachers due to government restrictions, and the local teachers cannot provide an immersive English environment. If the students haven’t covered the material properly with their local teacher, the 35-minute session can feel like a lifetime. “It seems like you haven’t learned this,” Julia says with a tired smile as the bell rings to signal the end of class. During the second of the two periods, as I watch thirty-six children struggle to understand challenging English sentences, I can’t help but wonder how many of them will be in Shanghai two years from now. 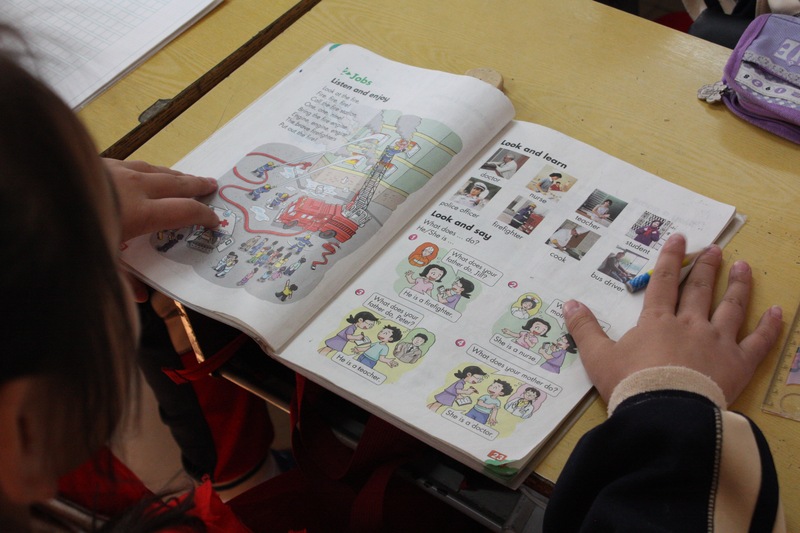 The migrant schools in Shanghai end after sixth grade, as students return to their hometowns to take the zhongkao middle school entrance exam, the misbehaving younger sibling of the gaokao, China’s equivalent to the SAT. To remain in Shanghai without a city hukou beyond sixth grade is to drop out of the formal education system entirely. Despite the steps that have been taken by the government and organizations like Stepping Stones, the majority of these smiling faces, eager to step in front of my camera, will not be here two years from now. As the classes end and we pile back onto the bus, my mind drifts back to reality, a place that an elementary school can quickly obscure. 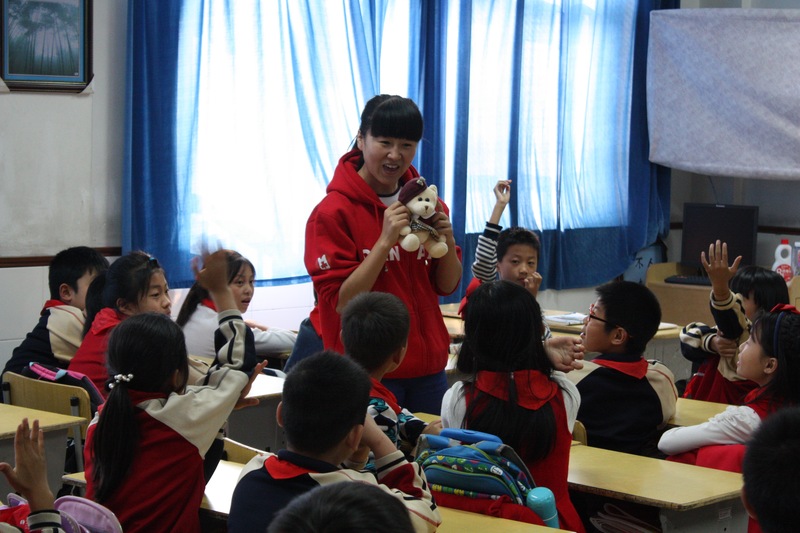 The reality of China is that NGOs like Stepping Stones have to jump through a lot of hoops before stepping foot in an elementary school is even an option. Many believe that under President Xi Jinping China’s government has tightened its proverbial fist, choking off some of the space for civil societies that had opened up under former party leader Hu Jintao. A week before my trip to S Elementary, we visited the Stepping Stones office to talk about the past, present, and future of the organization. While we were there, Hua spoke to us about the mostly beneficial effect of the government involvement in migrant schools. However, she did note that although more government control comes with more funding, it also comes with the occasional caveat. In this case, since 2008 more schools have been reluctant than before to allow volunteers into their classrooms due to increased accountability to government officials. This kind of uncertainty is a well-known part of the game when working for an NGO in China, and to be a part of one is to “always [be] taking risks” in one way or another. For instance, one of the biggest struggles many NGOs in China face is the fear of being evicted from the country if they find themselves the center of unwanted government attention. As a result, many attempt to circumvent the risk by registering with the local government. However, local registration can be a tricky business, as China is reluctant to nominally allow foreign aid into many areas. Stepping Stones is no stranger to this struggle, first having registered as an NGO in Hong Kong in September 2011 before finally registering again as a local Chinese NGO in December 2013. They now maintain both registrations. Part of the deal in becoming a locally registered NGO involved leaving Hua’s name off of the official paperwork, despite her years of involvement. In fact, it was a stroke of luck that led to Stepping Stones acquiring local registration, and not Hua’s years of knocking on doors asking for help. Registration is not the end of an NGO’s struggle in China, but it represents the importance of understanding the role government relationships play in their success. Officially migrant schools are not allowed to have volunteers, supposedly because of worries about liability. So while the Education Bureau of Shanghai is supportive of the work Stepping Stones does in private, “all they can do [in an official capacity] is look the other way.” Legally speaking it is the responsibility of each school principal to manage the risk of allowing foreigners in to teach, a burden that deters some schools from partnering with Stepping Stones. The frustration of the unavoidable need for an in with the government is only part of the struggle when it comes to running an organization with over 1000 volunteers on record. Finances, management, and high schoolers provide their own challenges to Hua’s weekly schedule. During our conversation she repeatedly praised good fortune for Stepping Stones greatest successes, not the least of which their office space, which has been donated by the Huaqiao Foundation since 2009. Sandwiched between Rotary International and bookshelves brimming with Dr. Suess books, the rent-free home for their full-time staff relieves some of the financial burden that comes with the territory. In fact, Stepping Stones has struck it rich when it comes to finances across the board. Several well-connected donors cover nearly all of their administrative costs, frequently finding loopholes in order to fund an organization where a high percent of costs are just that—administrative. It takes time and energy to organize events, but in the end nearly everyone involved outside of the small office staff is a volunteer. Stepping Stones has and will continue to rely on the kindness and support of both its volunteers and its donors in order to continue its ten-year streak of reaching the children left behind by the rest of society. In those years it has garnered an impressive resume—and it faces the uncertainty of China with an entrepreneurial optimism. From a new program manager who demands commitment, responsibility, acknowledgement of privilege, and 300 yuan from Shanghai’s elite high school students, to Hua, who demands a financial contribution for wealthy corporations’ volunteer events, Stepping Stones is dedicated to building a future for Shanghai’s migrant children. If you want to donate or get involved with Stepping Stones, it’s only a click away! Corrections: A previous version of this article listed Lara Butera as a Program Coordinator. The Program Coordinator works in the Stepping Stones office, Butera is the Site Coordinator.